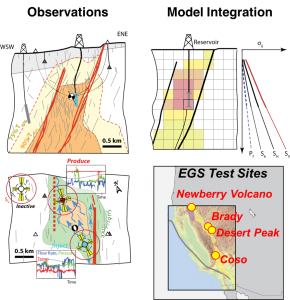 Structural geology involves mapping the three-dimensional distribution and type of structures that accommodate deformation in the earth. Brittle fault zones are composed of a few essential elements: (1) a slip surface; (2) the core consisting of highly deformed rocks which can include gouge or cataclasite; (3) the damage zone surrounding the core which consists deformation spatially associated with the fault. 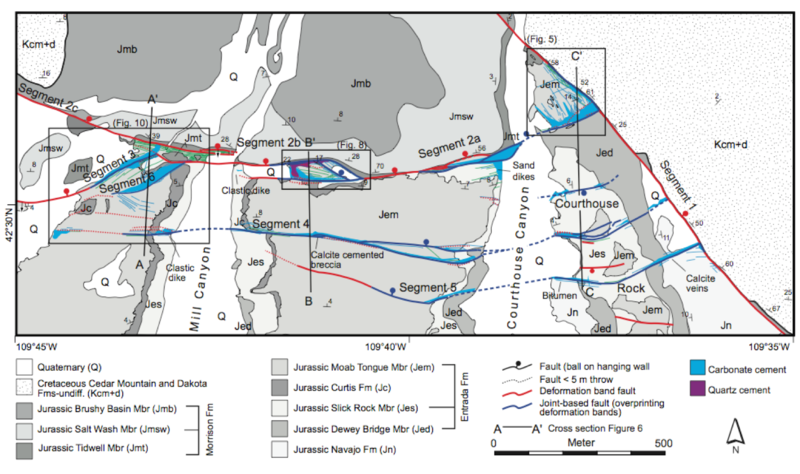 In some instances this is simply referred to as the structure of the fault zone, but more recently this has been referred to as the architecture of the fault to avoid confusion with the many uses of the term structure. 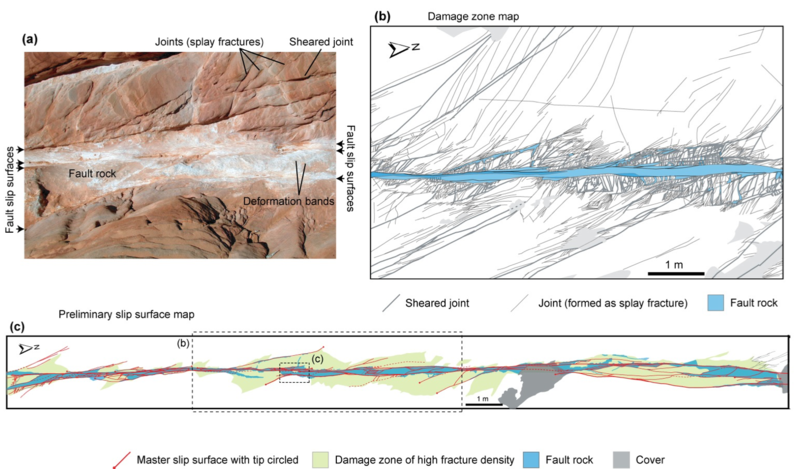 Fault zones can have a significant impact on fluid flow. 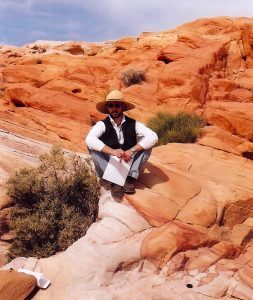 In many cases they change the local permeability of a rock mass and can form vertically extensive zones that either conduct or impede fluid flux. 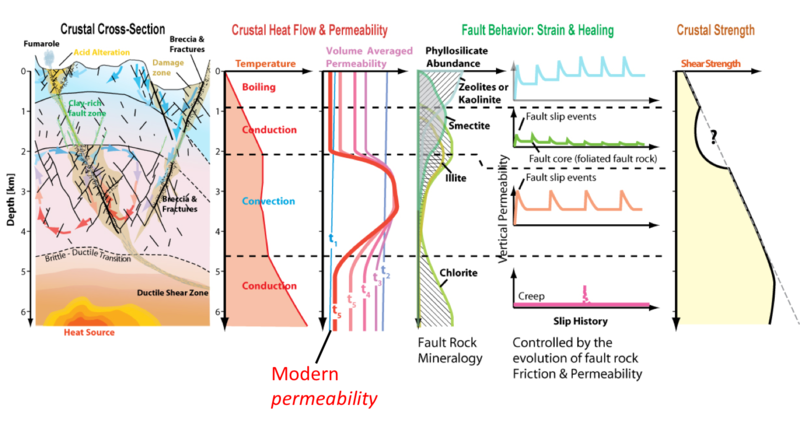 In stratified materials there are four four end-member cases: (1) faults that act as barriers to flow; (2) faults that are transparent to flow, but which juxtapose rocks of differing permeability; (3) faults that act as high permeability conduits to fluid flux; (4) faults in which the damage zone and core differ in permeability, such that the damage zone isolates a permeable fault core, or in which a low permeability fault core separates damage zones of enhanced permeability. In massive rocks, such as igneous or metamorphic materials, faults usually act as preferred fluid conduits. However, focusing fluids along a fault where frictional slip has reduced grain size and created fresh crystal surfaces promotes chemical reaction. These reactions can promote healing, recovery of cohesion by mineral precipitation, or alteration that introduces new phases into the fault and new physical properties. GoalsBecause variation in slip along faults distort the volume around them, closely spaced faults form interacting networks. The degree of interaction depends on the geometry of the faults, their history of slip and resulting gradients in slip, and the mechanical properties of the rock volume they offset.